When Surrender Was Not An Option is the dramatic World War II account of 2nd Lt. George G. Crawford's experience as a prisoner of war in Nazi Germany from the time his B-24 bomber was shot down until his liberation and return to the United States. It is a saga of men on the cutting edge of courage who did not just endure a long Nazi nightmare. Rather, in the best tradition of U.S. military duty, George and his fellow captives resisted and harassed the enemy in every way possible. By elaborate escape methods, they diverted thousands of German troops who otherwise would have been on the fighting front. Although his captors temporarily emaciated his body, they failed to extinguish his indomitable spirit, which serves as an example and inspiration to all Americans. Other books have been written, and movies made about our prisoners of war during World War II. Mr. Crawford's account is from one who was there and who actually experienced and survived the hardships and depredations of the German prisoner of war camps that we have heard about. He writes with a smooth, easy to read style that holds the reader's attention from start to finish, from his last mission when he was shot down and captured, his existence in the camps, the long march and finally liberation with an unauthorized visit to Paris. His descriptions of his experiences are highly visual and one can almost see himself or herself alongside the author. 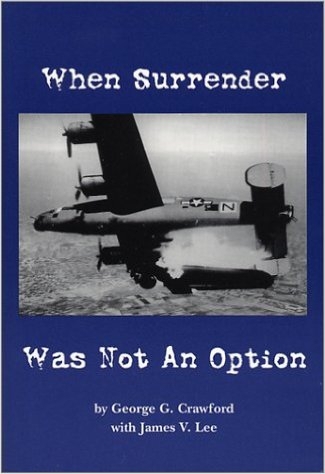 When Surrender Was Not An Option should be a "must read" not only for the reader with a military background, but for those from later generations who would like to learn of the sacrifices made by the generation of their fathers and grandfathers. With each passing year, the reality of World War II and the heroism of its soldiers fade. Every person old enough to remember the war but, and especially those who came after it, should read When Surrender Was Not An Option. Second Lieutenant George Crawford tells of his experiences as a POW in Nazi Germany with honesty and even a touch of humor. He not only endured the brutality of being a prisoner of war, he continued to fight, refused to give up, and triumphed in spirit and body. When Surrender Was Not An Option is a true story- one you won't soon forget.